U.S. Enlarges Its Military Footprint In Eastern Europe, To Mixed Reviews : Parallels In Poland and Romania, some are happy to have new U.S. bases in light of recent Russian moves. 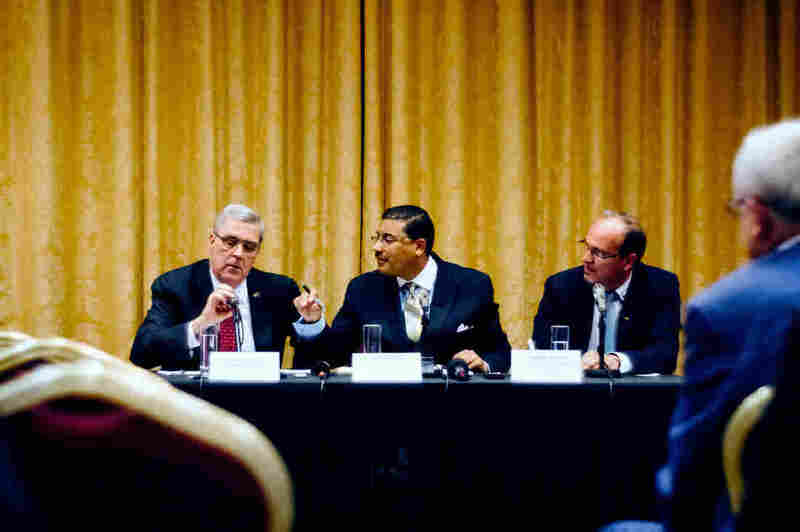 But others say the most likely result will be heightened tensions with Moscow. U.S. military personnel stand watch ahead of the May 12 inauguration ceremony of the U.S. anti-missile station, Aegis Ashore Romania, at Deveselu, Romania. The station is part of NATO's anti-missile shield for Europe. The most tangible sign of a growing American military presence in Eastern Europe, behind the former Iron Curtain, is tucked inside a former military base in rural Romania. Hidden from view is a U.S. naval facility, where sailors use high-tech radar day and night to watch for incoming ballistic missiles fired at NATO countries. If any are spotted, the Americans would fire back with SM-3 Block IIA missiles. A second such American site will also be built in Eastern Europe over the next two years, this one near Poland's Baltic coast. It's inside a base that once belonged to the Nazis and later the Soviets. Once this site is finished, the entire $800 million ballistic missile defense shield for NATO countries in Europe, more than a decade in the making, will be complete. Top U.S. and NATO officials last week declared the Romanian facility up and running, and a day later broke ground on the Polish site. They say the state-of-the-art Aegis defense system, which will ultimately be under NATO control, is about protecting the alliance against rogue states like Iran and has nothing to do with Russia. But Moscow considers the American bases on NATO's eastern flank to be a provocation, a position Russia has maintained ever since the alliance began moving into Eastern Europe in the 1990s, following the Soviet breakup. "After the deployment of those missile defense elements, we will have to think about how we can fend off the threats to the Russian Federation's security," Russian President Vladimir Putin said Friday. He has rejected repeated assurances by the Americans and NATO that Aegis is designed to take out only short-and-medium range ballistic missiles fired from outside Europe. 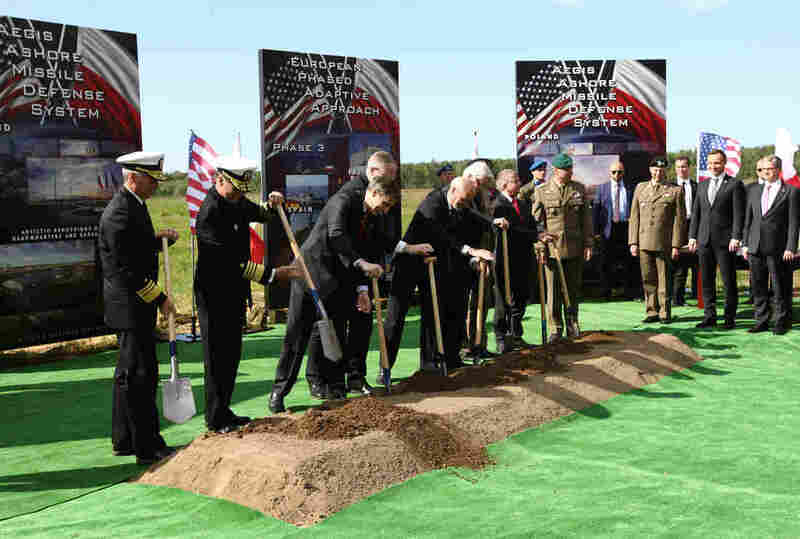 "It is fully compliant with existing arms control regimes," U.S. Deputy Defense Secretary Robert Work said at the groundbreaking in Poland. "It's not about Russia," added Frank Rose, the assistant secretary of state for arms control verification and compliance, who attended the Romanian ceremony. Rose says the alliance has "been clear for over 20 years that U.S. and NATO missile defense are not directed against Russia, nor do they have the technical capability to undermine Russia's strategic deterrence." 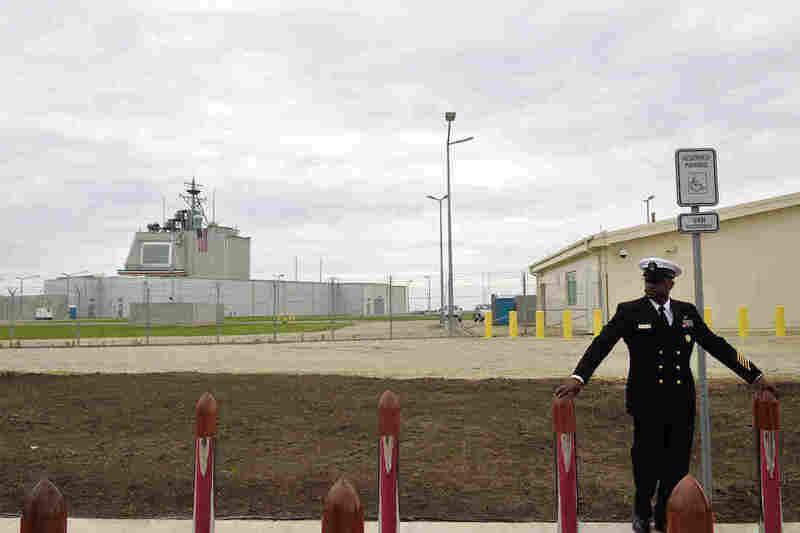 That comes as a surprise to many Romanians, who have a different view of the U.S. Navy's "Aegis Ashore Facility," located on the outskirts of Deveselu, a farming community that is a two-hour drive southwest of the capital Bucharest. Romania, like Poland and the Baltic States, has been clamoring for more U.S. and NATO troops and equipment since Russia's 2014 annexation of Crimea and its backing for separatists in eastern Ukraine. The Obama administration responded by quadrupling its spending on initiatives intended to reassure its European allies, and it has been increasing the scope of military exercises in Northern and Eastern Europe. The plan also includes adding a third Army combat brigade in Europe, as well as a continuous rotation of 4,000 NATO troops in the Baltic States and elsewhere in Eastern Europe. The Kremlin, meanwhile, is reported to have sent more troops and weapons — including missiles capable of carrying nuclear warheads — into Kaliningrad, a Russian enclave bordered by Poland and Lithuania. The buildup on both sides has been accompanied by an escalation in rhetoric. At a change-of-command ceremony earlier this month, U.S. Defense Secretary Ash Carter lashed out at Moscow over its actions in Ukraine, Moldova and Georgia. He criticized Russia for intimidating its Baltic neighbors. "And most disturbing, Moscow's nuclear saber-rattling raises troubling questions about Russia's leaders' commitment to strategic stability," Carter said. It's making Romanians nervous, too, and helps explain why they are comforted by the U.S. Navy setting up a base in their country, even if the Americans say it's not about Russia. Marius-Lucian Obreja, who heads the Romanian Senate's Defense, National Security and Public Order Committee, says Russian actions are destabilizing Ukraine. And Russia's annexation of the Crimean Peninsula, some 300 miles off Romanian shores, "caught us off guard and leaves us in huge need of help from a military power." He said the Romanian government is working to modernize its military and join the handful of NATO countries that are spending 2 percent of their gross domestic product on defense, which alliance members agreed to do in 2014. But he added it will be at least a decade before the improvements are complete. The senator said he believes that even if it isn't directly targeting Russian missiles, the U.S. facility will make Moscow think twice about causing trouble in Eastern Europe. There's also a palpable economic benefit to the American base for the 3,500 residents of Deveselu, where the whole village is getting a facelift. Mayor Ion Aliman says about $8 million in local and European Union funds have gone to upgrade the power grid, sewage systems, roads and municipal buildings to accommodate their new American neighbors, who officially moved in 18 months ago. In addition, the U.S. Embassy has spent hundreds of thousands of dollars to refurbish the local school and build a new kindergarten. "Like many Romanians, my grandfather had been waiting for the Americans since 1944, and they have arrived" says Aliman, who has several American and NATO flags hanging in his office. 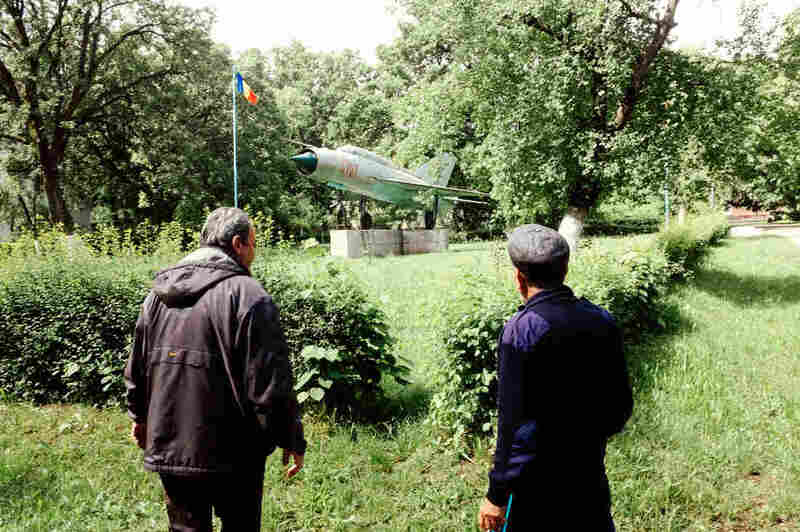 A MiG-21 fighter — a leftover monument from the Soviet era — is the centerpiece of the Aviators Neighborhood in Deveselu, Romania. Now the base has become a U.S. Navy facility that is part of NATO's anti-missile shield for Europe. Workers were also busy improving roads across from the Navy base last week in a housing complex known as the "Airmen Neighborhood." Lined up to look like a Russian MiG jet when viewed from above, the apartments and homes were built for pilots who worked at the former Warsaw Pact base. A handful of the Deveselu base veterans still live here, including retired navigator Marian Georgescu, 54. He boasted that he'd given some of his American neighbors rides in his horse-drawn wagon, a common form of transport in Romanian farming communities. Anca Nelson, 34, of Highland, N.Y., who was visiting her mom and dad, a retired paratrooper transport pilot, says "it's great to have a different culture so close to us." "This opens our minds a little bit," she added. "This is a very traditional community and we haven't had contact with foreigners very often." Nelson said she hopes the base will attract investors and provide jobs for residents in this impoverished region. Hundreds of miles to the northwest, in Poland, Slupsk Mayor Robert Biedron had the same hope for his picturesque city and its 100,000 residents. But he has since soured on the American base that was first proposed nine years ago and where ground was finally broken Friday at the Redzikowo Air Base, 2 miles from his city hall. Biedron said the Polish government had promised to bring in investors and improve the highways, port and railway in Slupsk in exchange for the base, which he said would have otherwise been turned into a regional airport for residents. But none of it ever happened, and the new government that took over last fall refuses to even talk about it, Biedron said, adding that he is incredibly frustrated. "There are so many limitations today" because of the base, he explained. "If I want to built anything in my city, I have to ask the American government for permission ... like if I want to build a factory, if I want to build a higher block of flats, I have to ask — not in Warsaw, but in Washington," the mayor said. "This is so crazy!" He added that analysts estimate the region will suffer big economic losses because of the new base. Other Slupsk residents I spoke to worried that the base will make them ground zero for any Russian retaliation, fears that were exacerbated by a Russian military jet conducting a "barrel" roll last month over a U.S. Air Force plane that was flying a reconnaissance mission above the Baltic Sea. One 72-year-old retiree, who said she was too afraid to give her name, whispered that she has always been against building an American base in her community. "It's a provocation to the Russians," she said, "and that makes a lot of us afraid."